The regional office of the Philippine Statistics Authority is currently looking for at least 28 data encoders. In a job bulletin, the office announced that they are going to need the data encoders for the following project: 2018 Family Income and Expenditures Survey (FIES). Applicants have until August 13 (Monday) to hand over their resumes and application letters. They must submit their applications at the Statistical Operations and Coordination Division, PSA RSSO CAR, 141 Abanao Extension, Baguio CIty. To be eligible for the position, an applicant should have finished at least two years of college education, should be computer literate, should have decent typing speed, and should be willing to work on shifts from Monday to Saturday. 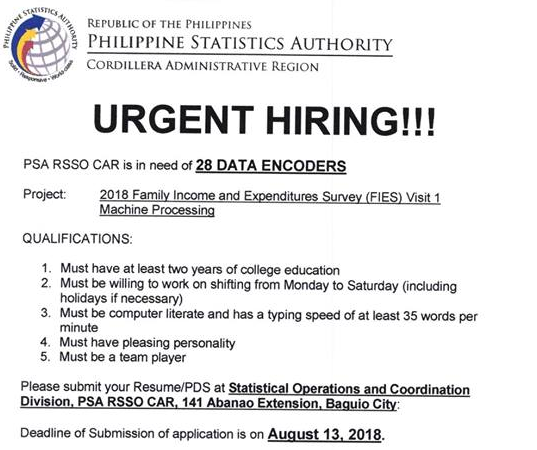 PSA RSSO CAR is in need of 28 data encoders. 1. Must have at least two years of college education. Please submit your Resume/PDS at Statistical Operations and Coordination Division, PSA RSSO CAR, 141 Abanao Extension, Baguio CIty. Deadline of submission of application is on August 13, 2018.